Survival of the Quickest is one of Kat and Ana's microgames in WarioWare: Twisted! The microgame name is a parody on Herbert Spencer's coinage of "survival of the fittest" to describe evolution. The purpose of the game is to complete the evolution stages by pressing repeatedly. 1st level difficulty: The player must press three times to complete the evolution process. Clearing it, a monkey evolves to a man. 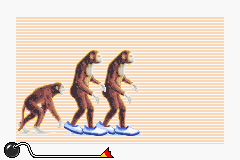 2nd level difficulty: The player must press six times to complete the evolution process. Clearing it, a common dog becomes a dog with human body shape. 3rd level difficulty: The player must press nine times to complete the evolution process. Clearing it, a monkey evolves to a robot. This page was last edited on September 19, 2018, at 21:25.